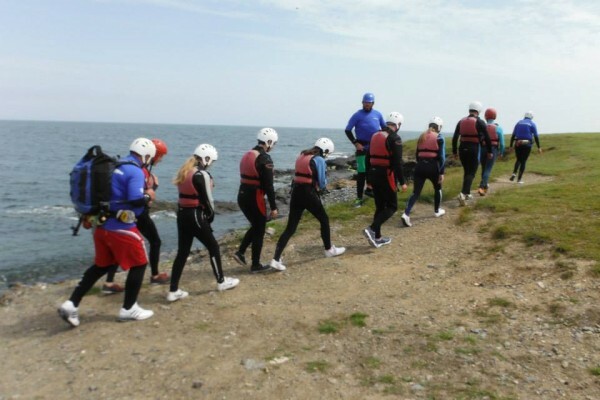 Matthew Gaynor of the De La Salle Ventures gives an account of their 5 night stay in Shielbaggan Adventure Centre last month, which included a day trip to Oakwood theme park in Wales. We congregated at the den circa 6pm on Tuesday evening and loaded up the required gear into the various cars and vans at our disposal. Before long we were sitting in our respective banterwagons on the way to get the ferry from Passage East (via Faithlegg to pick up the tents because apparently they’re important for camping or something). It was shortly after 7 when we rocked up to Shielbaggan Outdoor and Education Centre in Ramsgrange, where we successfully pitched our tents and Neillers made some sort of an attempt at pitching his. With an early morning ferry-trip the next morning playing on our minds, we were all in bed early that night. I can’t remember what time we were woken up at on Wednesday morning, but it was a considerable number of hours before we were ready to be. After a quick breakfast of ‘Krispy Rice’ and a banana, we were piled into the cars, listening to Christmas songs (courtesy of Ireland’s number 1 DJ; M.C. Owen Riordan). The ferry left Rosslare at about 10 that morning, and after 3 hours of sitting sleepily in the lounge and feeling pretty queasy, the boat pulled up in Fishguard, Wales, and we got on board the buses which would bring us to Oakwood. We arrived in Oakwood at 2 o’clock, just as all the rides had finished opening. It being a Wednesday, the park was very quiet, which was good for us because quiet park = short queues. We went on every ride in the place at least twice, but apart from the doughnuts covered in chocolate sauce, the undisputed highlight of the day was Vertigo. A 50-metre drop, which was a cross between a giant swkng and a bungee jump. After the park closed at 10pm, we went to an arcade, but in truth, most of us were too tired to get involved in anything, and we got a bus from Oakwood to the ferry home. We arrived at the ferry port at midnight and sat around until 1:30am, when we could board the ferry, scheduled to leave at 2:30am. We got on the ferry, only to be told that it had been delayed by 12 hours as a result of two broken generators. Thus began the longest 15 hours ever spent by ventures on any camp, anywhere, ever. After 2 and a half hours of walking around like zombies, and some pretty shrewd negotiating skills on the behalves of Craig, Adam, Riordan, Oisin and Dana, we managed to secure 3 single cabins between the 11 ventures, and a cabin each for the leaders. While the delay seemed pretty disastrous at the time, we were compensated with a free breakfast (which most of us slept through), and lunch (I had chicken curry, chips and rice if anyone is wondering). After finally getting off the ferry, everyone agreed that a call into Wexford’s KFC was warranted. We got back to Shielbaggan/Ramsgrange at around 7:30pm that evening, and were in bed by 10pm, after a quick game of rugby with the ventures from Cork who were also staying at the campsite. We were up reasonably early on Friday morning to do our first day of on site activities. First up we had caving, which was pretty epic, despite being incredibly claustrophobic. We had to manoeuvre our way around a series of tunnels which had a circumference scarcely bigger than our bodies. After the caving, we had a go on the high ropes course, where 4 of us at a time had to climb up a pole and stand on a small platform together. It was challenging, but every group managed it, although some groups lasted longer than others… Next up we had archery, where some of us excelled, while with others it was probably advisable not to stand anywhere in a 20-metre vicinity of them while they took a shot. At this stage we were all starving, and so the sight of our ham and cheese rolls back on site was a welcome one. After lunch we went coasteering in Slade, this took up most of the afternoon and was very enjoyable. We explored some of the coastline between Slade Harbour and Hook Lighthouse, jumping in the various pools and inlets. 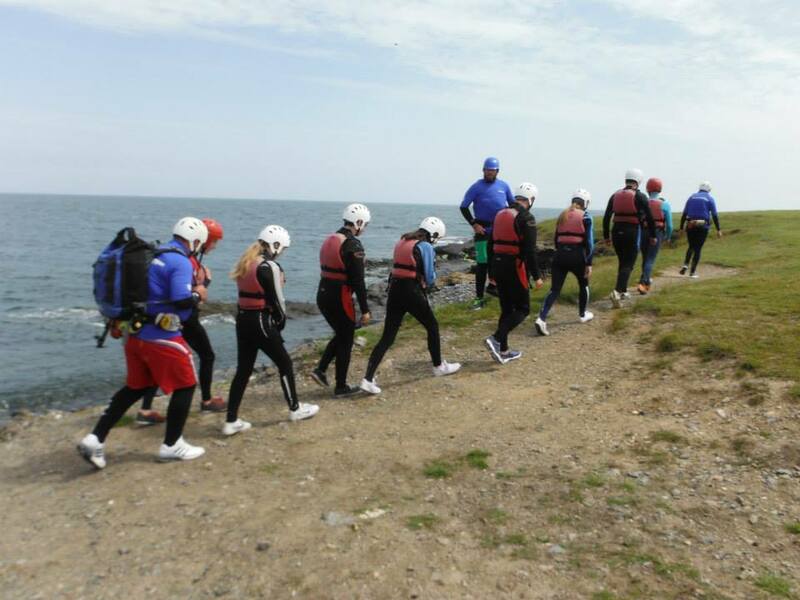 The coasteering took up most of the day, and everyone was wrecked afterwards. We had a dinner of chicken curry, and lounged around for the rest of the evening, all too tired to do much else. Saturday, we were afforded a lie-in which we all took full advantage of. It must have been at least 11:30am when we emerged from our tents, and got our breakfast, or maybe it was lunch at that stage, I’m not really sure… anyway, we dossed around for a bit, Burkey proved he was a far superior footballer to Neillers, and Clodagh and Dale went off to Fleetwood Mac and Spain respectively. Around 1:30pm the instructors came over to us to bring the remainder of us away to urfing on one of the local beaches. The surfing was difficult, or at least I thought so, nobody else seemed to have too much bother with it, so I ditched the surfboard and had a swim for a couple of hours, as the rest of them did whatever it is that surfers do (surfed?). The plan for that evening had originally been to take ourselves down to the Kilmore Quay food festival, but the weather (for the first time all week) wasn’t really conducive to us performing our desired activities so instead we went to see the highly entertaining Minions Movie in Wexford, before returning to camp and our sleeping bags. Sunday was a get up and go sort of day, as Gary drove the van over to help us load up the gear and head home… we were on the road home by 12, and it was agreed by everyone to have been a reasonably succesful annual camp.